Is your child ready for pre-school? Or is he or she already in school but struggling with reading? There is a new source for teaching your child how to read and write that is sweeping the Internet. * Phonics: the relationships between letters and sounds. * Fluency: the ability to read quickly and naturally, recognize words automatically, and group words quickly. * Vocabulary knowledge: remembering new words and what they mean. * Text comprehension: processing what is being read and developing higher-order thinking skills. 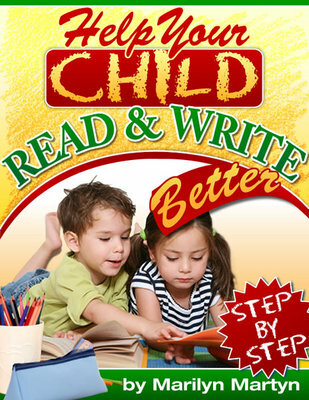 Help Your Child Read & Write Better helps you improve all four areas. Illustrations are included because we think in pictures. Your child will learn the sounds of English and the combinations of letters that represent them. He or she will learn how to blend sounds into words as well as how to spell them. Recognizing words when they see them is also learned in addition to spelling patterns for English words. They will quickly learn to read simple sentences. Help Your Child Read & Write Better is for the parent of children with reading challenges or who simply want to give their children extra help or an earlier start. We can cite the benefits to be found in this book or you can take advantage of our 100 satisfaction or your money back guarantee. We take the risk. You get the benefit. Dont wait another minute to help your child advance. Grab your copy now while the price is so low. Youll be glad your did and someday your child will thank you. Arm your child with the skills they need to succeed. Help Your Child Read and Write Better! As a child Marilyn Martyn was a passionate reader. The Wind in the Willows is still her favorite book. Reading it brings back happy memories of a childhood surrounded by books. She remembers her first day at school and the steps she took learning to read. There were easy moments and frustrating ones when a word wouldnt decode easily. In the good old days children were taught to read from a graded series of books called readers. By the end of second grade a student would be a fluent reader and understood how words are spelled. The readers were mastered step by step. Marilyn has found these books she learned to read with and is amazed at the depth of material they contain. Marilyn trained as a teacher and librarian specializing in childrens literature developed a career around her love of books and reading. She also spent some time as an education consultant for two publishers, visiting many schools. She has taught children from prep grade to year nine in secondary schools. She found opportunities to teach children who had difficulty learning to read. She taught many students in schools and still does this as a private tutor. After sitting with many frustrated students who did not know how to decode (sound out) words, Marilyn devised a series of lessons that gave them the ability to decode quickly. These lessons are the foundation of her book. Modern reading research found what her teachers already knew. Early, systematic and explicit teaching of how to hear the sounds in words and how to sound out words is vital in the early stages of learning to read. Marilyn wrote her book to share her knowledge and experience to help as many people as possible to become fluent readers and writers. P.S. Why are you down here? Grab your copy and start your child on the road to success today!